Have you ever had that sinking feeling after you buy something that you made the wrong choice? Maybe you bought a stock like Facebook or Amazon, and then changed your mind. Or maybe you bought a book and decided afterwards to return it. In most cases, it’s no big deal to reverse transactions like these but what happens when you apply for a credit card and later want to decline it? 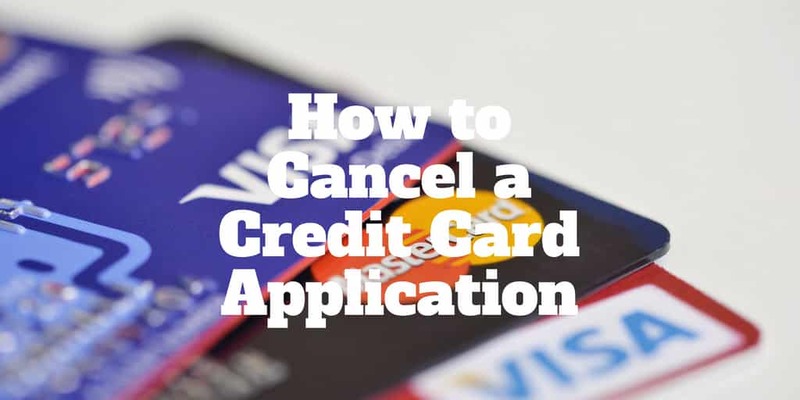 If you are wondering how to cancel a credit card application after the fact, you have some options that we will share below. Is Your FICO Score Affected When You Cancel A Credit Card? Should You Cancel A Credit Card Application? Before canceling your credit card based on a knee-jerk reaction, it’s wise to school-up on the factors that affect your credit score so you make a more informed decision. You may already know that paying your bills on time and paying off your balance each month help you to side-step penalties that could hurt your credit score. But did you know that the length of time you have held your credit cards, otherwise known as Age of Credit is a factor too? Credit card issuers like to see that you have held your credit cards for a longer period versus a shorter timeline. It shows them that you have demonstrated financial responsibility by paying your bills on time over a long duration. When you cancel a credit card application, which effectively means canceling a credit card after it arrives in the mail, the maturity factor that affects your credit score is negatively affected. Depending on the length of your credit history and the number of credit cards you possess, you will be affected more or less. For example, a pensioner who has held say an American Express credit card for years along with half a dozen other credit cards may not be affected too much by canceling a credit card quickly. However, a first-time credit card user who had a last minute change of mind after submitting a credit card application is likely to be more severely penalized because they have a comparatively limited credit history to help the credit card issuer assess how risky a user they will be. Beyond the Age of Credit, another factor that affects your credit score is your Credit Utilization. Each credit card you receive comes with a credit limit. Intuitively, you might think you can spend up to the limit each month without consequence. After all, why would a credit card issuer provide you with a line of credit unless they expected you to use it, right? Credit card issuers like to see that you can manage your finances carefully and spend less than you need. By maxing out your credit card limit each month, your credit card provider will probably adjudicate that you are struggling financially, which means you are put in a high risk bucket. Unfortunately that means your credit score will probably take a hit. That’s when the dominos start to fall because a lower credit score usually means higher interest payments on any new loans you receive. To avoid paying higher credit card interest rates and more interest each month on any new loans, try to avoid maxing out your credit card each month. A good rule of thumb is to keep your spending less than 30% of your credit card limit. Or if you want to show your credit card issuer that you are very low risk, keep your spending capped at 10% of your credit line. One of the big things that affects your credit score is the number of hard credit checks or inquiries made on your account. Let’s say you apply for a SoFi personal loan, for example, you will at some point in the application process be asked to consent to a hard credit check which may hurt your credit score. Similarly, when you apply for an auto loan or mortgage, lenders will almost always perform a hard credit check. The more inquiries on your account, the more likely it is that your credit score takes a hit. With that said, credit bureaus like Experian, TransUnion, and Equifax know that when you shop for loans you will often inquire with many lenders in a short time frame, so a 30 day “grace” period is generally provided to allow you shop around for the best rates. When You Cancel A Credit Card? When you cancel a credit card application, your credit score may take a hit but by how much? In practice, the maturity of your credit is not a major factor in calculating your credit score so a prime borrower with lots of credit cards and a long history of making timely payments and paying off balances in full may not see their FICO score fall by much. While the major credit bureaus don’t reveal precisely how they calculate credit scores, it’s probably a fair bet to assume that canceling a credit card is worth no more than a few percentage points overall. All the other factors like credit utilization, number of hard credit checks, number of credit cards, payment history, and balances will all combine to affect your score more significantly. With that said, if you can hang tight for a month or two before canceling your credit card or switching to another credit card, the better off your credit score should be. If you are thinking to yourself: “I applied for a credit card but don’t want it because I have fair credit or bad credit” then take a deep breath before selecting the “cancel credit card application” button! While a credit card user with a long established history as a prime borrower may not be affected much by refusing a new credit card, a sub-prime borrower with a so-so FICO score needs to tread more carefully. Rather than cancel a credit card application, give your credit card issuer a buzz to see if you can swap your card for another more suitable card. Maybe you picked a credit card with a high annual fee like the Chase Sapphire Reserve Card and decided it wasn’t for you. By calling Chase, you may discover that the Chase Freedom credit card is a better fit. Or maybe you chose a high limit credit card but decided a lower credit line would be more suitable based on your spending habits. Give the credit card issuer a call and see what credit card alternatives exist. The allure of a new credit card is obvious: points, miles, rewards, and bonuses! But after you apply for a credit card the reality sets in: annual fees, APR interest rates, credit card balances, and monthly payments. It may be tempting to do an about-turn and decide to cancel your credit card application but, before doing so, compare credit card alternatives to see if another type of card might be a better fit. A credit card with lower annual fees or a 0% balance transfer card may be an ideal fit and your credit card issuer may be willing to swap your current card for a more suitable one if you call them to inquire. While canceling a credit card will usually result in a hit to your credit score, prime borrowers will likely be affected less than sub-prime borrowers, who may experience more pain. So, where possible it is best to swap out a credit card instead of canceling a new card. Even if you don’t plan to use your credit card, it may end up helping your age of credit factor that in turn affects your credit score. Plus, you can always use your new credit card as a last resource if you need access to credit or cash in a hurry. Have you ever had to cancel a credit card application? How did it affect your credit score? Share your experiences in the comments below, we would love to hear from you.